Winnipeg will see 5 to 10 cm of snow beginning today as temperatures stay steady at below-seasonal values through the rest of the work week. 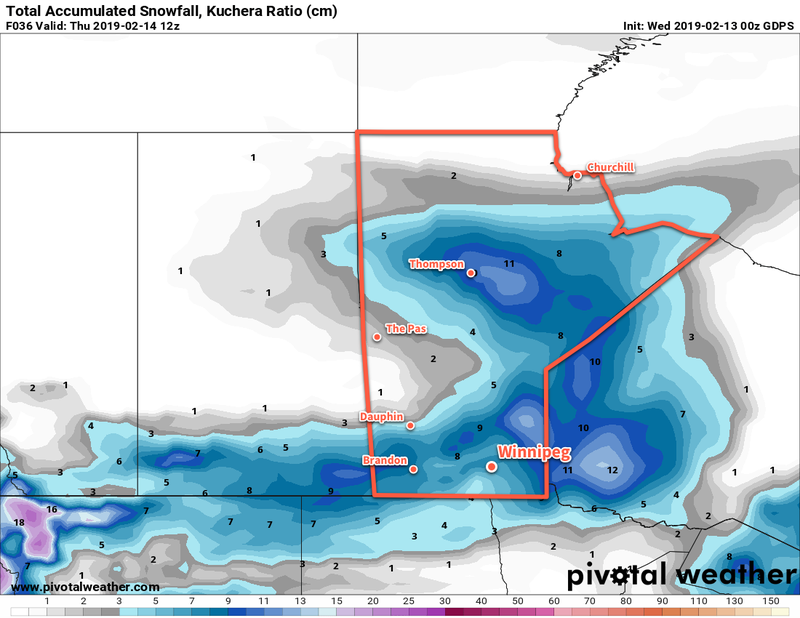 Winnipeg will see more snow push into the city this morning that will persist through much of the night. The snow will come in two batches; the first will move through midday before easing in the afternoon, then the second will develop in the evening and persist through the night. By the time the snow tapers off on Thursday morning, the city will likely see 5 to 10 cm of the white stuff. Once the snow moves off, the city will see mixed skies for Thursday that will further clear out for Friday. Much of southern Manitoba will see 5 to 10 cm of fresh snow by the time the disturbance laves the province on Thursday morning. Daytime highs will be fairly steady the next few days, generally around the -15°C mark. Overnight lows, however, will slowly drop as an Arctic high builds in from the west. The city will see a low near -21°C tonight and will then drop towards -27°C by the end the week. Winds will stay light through much of the snow event today, but will pick up out of the northwest overnight and increasing to 30 gusting 50 km/h for Thursday. Those winds will gradually ease Thursday night into Friday. Temperatures will continue at below-seasonal values through the weekend, but nothing like the frigid cold seen last week. Daytime highs look to stay in the mid-minus teens while overnight lows dip into the -20s. Winnipeg will see little change heading into the first half of next week. Today’s seasonal daytime high in Winnipeg is -8°C while the seasonal overnight low is -19°C.